The antioxidants help protect the body against the destructive effects of free radical damage in the body. The antioxidant vitamins A, C and E, Flavonoids and beta carotene are good to protect against the free radicals. They can delay the effects of ageing and can prevent heart disease and cancers or even reverse them. But which foods can provide us antioxidants? Oxidant foods broadly include vegetables, fruits and nuts. But of these which foods have the most antioxidants? Some foods are very high in antioxidant content compared to others. Based on the The Total Antioxidant Capacity, USDA has recommended 20 foods that should be eaten on a regular basis. The following is the list of antioxidant foods from higher to lower capacity. Dried Red Beans, Wild blueberry, Dried kidney beans, Pinto beans, Blueberry (growing organic blueberries), Cranberry, Cooked Artichoke, Blackberry, Prune, Raspberry, Strawberry, Apples - Red Delicious, Granny Smith, Gala Pecan, Sweet cherry, Black plum, Cooked Russet potato, Dried Black beans and Plum. The total antioxidant capacity varies from 13,727 in dried red beans to 3,903 in gala apple per serving size. not be better in its health benefits than the foods lower in the value, because the benefits depend on how its antioxidants are absorbed and utilized in the body. Following is a guide to the best 6 antioxidant rich foods. Berries such as blueberries (propagating blueberry), cranberries and blackberries, raspberries and strawberries possess very high antioxidant capacity. These berries are rich in proanthocyanidins antioxidants (Blueberry nutrition facts). 1 cup of blueberry has an antioxidant capacity of 9019 and that strawberry of 5938. I eat these antioxidants rich berries in custard, yougurt or fresh. Other fruits with significant antioxidant capacity are blackcurrants, figs, cherries, guava, oranges, mango, plums, red grapes, grape juice and pomegranate juice. Cooked vegetables such as artichokes, asparagus, broccoli, cabbage, beetroot and spinach are good sources of antioxidants. These vegetables loaded with vitamins, calcium, minerals, and phyto-nutrients have potential to lower the risk of many types of cancers and other diseases. In addition to the above list of antioxidant vegetables, carrots also offer good antioxidant content. Almost all spices are high in antioxidants. They include basil, cardamom, chilli powder, cinnamon, clove, coriander, cumin, garlic, ginger, mustard seed, parsley, onion, oregano, pepper, paprika, curry leaves and turmeric. But you cannot consume too much of spices, specifically chilli, cinnamon, cloves, cumin, pepper, etc. so that it is unlikely to get enough antioxidants by eating them. Spices like coriander, garlic,mint (growing mint in containers), parsley, onion, and turmeric (turmeric growing tips) can be eaten as a vegetable curry or in chutneys. You can eat garlic in vegetable curries and chutneys in good amount. Due to the presence of vitamins A, B and C, selenium, iodine, potassium, iron, calcium, zinc and magnesium in garlic, it is good for decreasing cholesterol and blood pressure and preventing cancer. You can consume turmeric by using its powder in vegetable curries. I also eat fresh turmeric as a vegetable. Some nuts are quite high in antioxidants. Nuts are a moderate sources of polyphenol antioxidants. Typical nuts are almonds, cashew, hazelnuts, macadamia, pecans, pistachio and walnuts. Eating daily a handful of nuts can favourably affect blood cholesterol levels and lower coronary heart disease risk. Walnuts have almost twice as much antioxidants than other commonly eaten nuts. Walnuts have higher quality of antioxidants than any other nut. Tea is an extremely rich source of antioxidants, catechin polyphenols. It has approximately ten times the amount of antioxidants found in fruits and vegetables. Green tea can be preventative against cancer, high cholesterol and heart problems. Adding milk to tea does not affect the antioxidant absorption in the body. The total antioxidant capacity of half a cup of dried beans are given below. The red bean is at the top of the USDA recommendation of antioxidant foods. Eating cooked (boiled or steamed) asparagus, broccoli, cabbage, carrots, mushrooms, peppers, spinach, tomatoes, zucchini and many other vegetables give us more antioxidants, such as carotenoids and ferulic acid, than they are eaten raw. According to January 2008 report in the Journal of Agriculture and Food Chemistry, the boiling and steaming better preserves antioxidants in carrots, zucchini and broccoli, than frying. You can grow some of of the best antioxidant foods in your garden. You need not have a big garden, you can even plant them in balconies, patio or terrace in containers (Growing in containers). 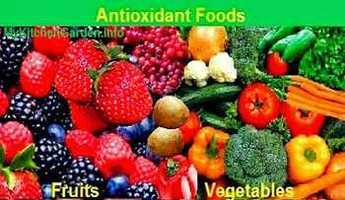 You will get these these antioxidant foods always fresh. Grow some of the berries, especially blueberry and strawberry (growing blueberries). I have grown blueberries and strawberries in pots. You can grow a mango tree in your backyard. Grow some of the spices easily such as basil, chili (grow chillies), coriander, garlic (how to grow garlic), ginger, mustard, parsley, onion, oregano, paprika and turmeric. It is very easy to grow these spices in your kitchen garden (growing herbs and spices). Grow asparagus, broccoli, cabbage, beetroot and spinach (growing spinach). Ronald L. Prior, The Journal of Agricultural and Food Chemistry, 9th edition, June 2004, USDA's Arkansas Children's Nutrition Center in Little Rock, Ark.